Let your friends and family know where you'll be! 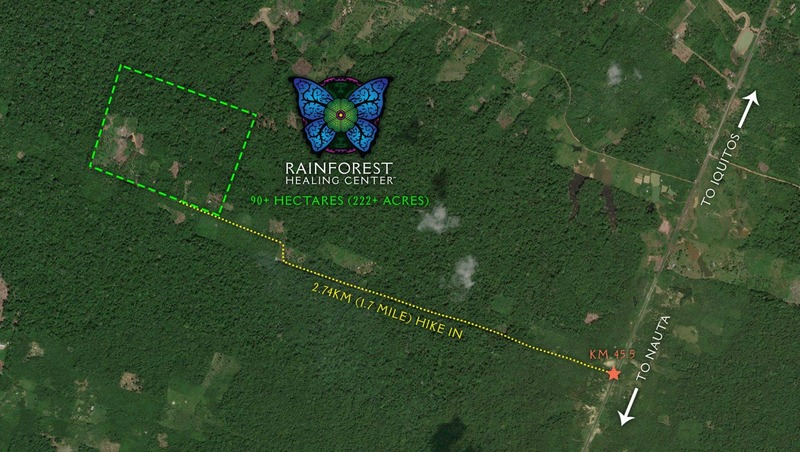 Rainforest Healing Center is accessed at KM 45.5 on the “highway” that connects Iquitos and Nauta in the Loreto province of Peru. From there you take a three kilometer hike over rolling hills along a dirt (sometimes muddy) path to arrive at our entrance. Our workers will help you port any heavy luggage into the center, but be ready to break a sweat and possibly hike in the rain! Once you arrive, your shaman or curandero will perform a smudging ceremony to help cleanse your spirit and belongings of any attached energies you may have brought or picked up during your travels. We use Palo Santo (“holy wood”), an aromatic wood that has been used for centuries in purification rituals and shamanic practices. After cleansing your body with the smoke of the Palo Santo, the shaman will chant and spray a perfume, Aqua de Florida, to place a protection spell over your body and soul. Once cleansed, you will ring our ceremonial bell three times to announce your arrival, and then you’ll cross the bridge as a symbolic gesture of stepping anew into your healing experience.